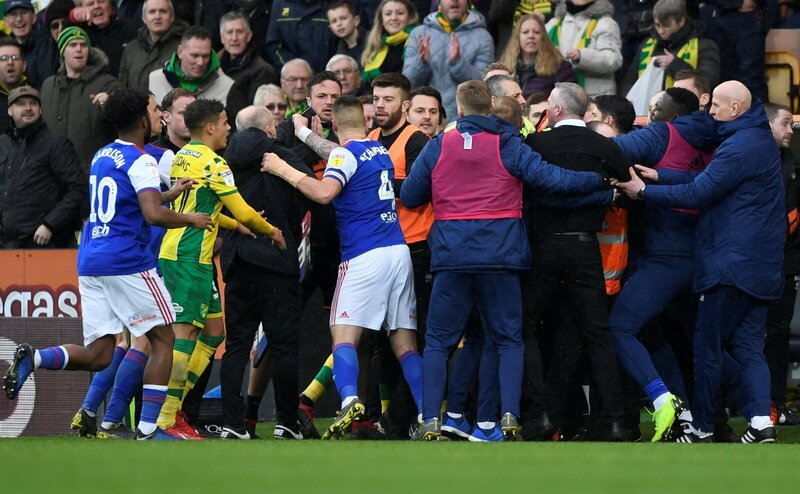 The Football Association are set to investigate the brawl that occurred in the East Anglian derby clash between Ipswich Town and Norwich City on Sunday afternoon, according to reports from Sky Sports. Tempers boiled between two arch rivals just before half-time, as a rash challenge on Tractor Boys midfielder Jon Nolan prompted a brawl on the sidelines, which saw police intervene. As a result, Ipswich boss Paul Lambert was shown a red card upon his return to Carrow Road, as well as Norwich’s head of performance Chris Domogalla, despite assistant head coach Edmund Riemer seemingly the one involved in the brawl. Reports have now surfaced, though, that the Football Association are set to study referee Peter Bankes’ report from Sunday’s derby, and they could also choose to charge the clubs with a ‘mass confrontation’ breach after failing to ensure that players and officials conducted themselves in an appropriate fashion. After their resounding 3-0 victory over their arch rivals, Norwich currently sit at the top of the Sky Bet Championship table, whilst Ipswich continue to struggle at the bottom of the league, they are now nine points adrift of safety. It is probably the right decision by the FA – both benches played their part and didn’t conduct themselves in an orderly fashion at all. It was a cagey affair on the pitch, as it should be in a classic derby match between two rivals, but off the pitch, things need to remain calm and collected. It was a dominating performance by Norwich, and it wouldn’t surprise me if they go on to lift the title at the end of the season.